Convicted 12.07.1878 of allowing consumption out of hours. Convicted 27.02.1895 of keeping open out of hours. 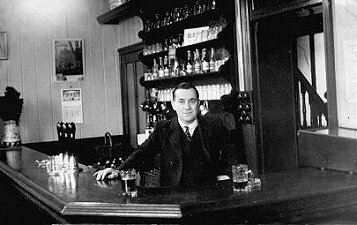 Bill Baker at the bar. In 1861 the name of house is given in the census as The PYERNS. Apparently a PIRN is known today as a form of shuttle once important in the development of the Flying Shuttle. On Wednesday 1st December 1869 John Plunkett appeared before the Magistrates, summoned to show cause why he should not contribute to the support of his wife, who was at that time an inmate of the Borough Asylum, at the cost of 12s a week. Mr. Plunkett said he could not contribute anything in consequence of bad trade. Such were his problems that he had been compelled to sell his horse and cart, and had four children at home who needed his support. At the time Mrs Plunkett was removed to the Asylum, he was ordered to make payments of 2s 6d per week, but he had only managed to make four payments. The bench studied his accounts books and agreed it was a hard case, but ordered that he must pay 2s 6d per week. 37¼ barrels of beer sold in the final year of trading. Site and surrounding area still derelict 2015. House No. 376 on 1845 Magistrates list.